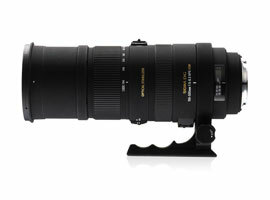 Introduced only six years ago, the Sigma 150-500mm f5-6.3 APO DG OS HSM has yet to be included in the firm’s revamping initiative but as one of the few zooms with a 500mm maximum focal length and modest price of under $1,100 it’s a popular model with wildlife photographers. As well as the tempting zoom range the Sigma has four-stop image stabilization (Sony and Pentax users are advised to turn off respective in-body stabilization according to Sigma) and an ultrasonic-type AF motor for fast and quiet autofocus. The optical construction consists of 21 elements arranged in 15 groups and includes three low-dispersion glass elements to correct chromatic aberration. Wildlife photographers will also appreciate the useful minimum focus distance of 86.6” (2.2m) at all focal lengths including 500mm and the lens’ maximum magnification of 1:5.2. With a 86mm accessory thread and measuring 9.9 x 3.6” (252 x 94.7mm) it’s a comparatively compact model but it’s no lightweight at 62.8 oz (1,780g). 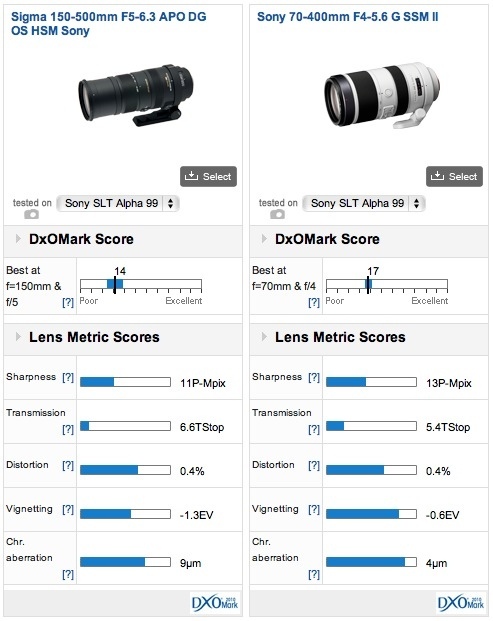 As a full-frame model we’ve partnered the Sigma with the Sony SLT A-99 for testing where it achieved a DxOMark lens score of 14 points. That’s slightly behind the results of the lens tested on the Nikon D610 here mainly on account of an increase in (pincushion) distortion over a greater part of the zoom range (from 200mm onwards) and some slight difference in uniformity. However, overall the lens performs similarly with the lens performing better at the shorter end of the zoom range, which although is fairly typical it’s still slightly disheartening given that the 500mm focal length is the main attraction. Vignetting is relatively low, as is lateral chromatic aberration although there’s some noticeable at either end of the zoom range, particularly wide-open in the corners at 500mm. Sharpness falls gradually towards the longer end of the zoom range. Note the drop at maximum aperture at 500mm. 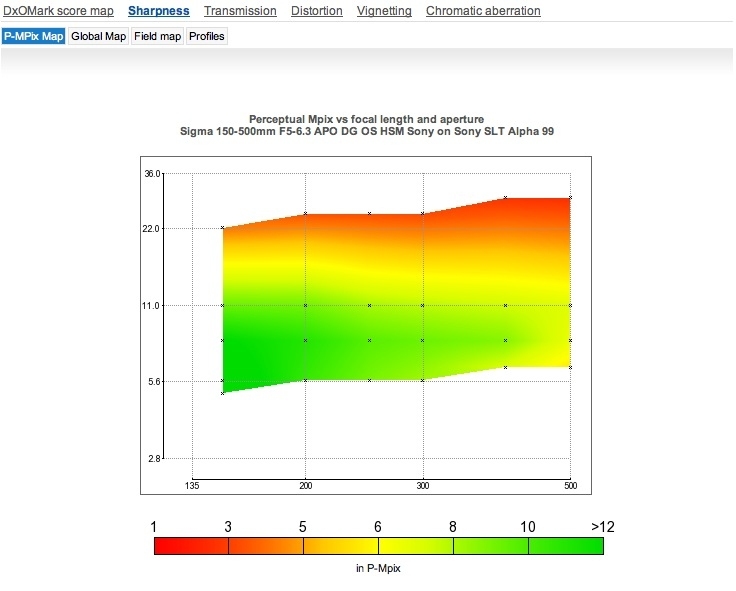 On the APS-C format 24-Mpix Sony A-77 the Sigma doesn’t perform quite as well with a similar fall off in sharpness witnessed on the Sony A-99. 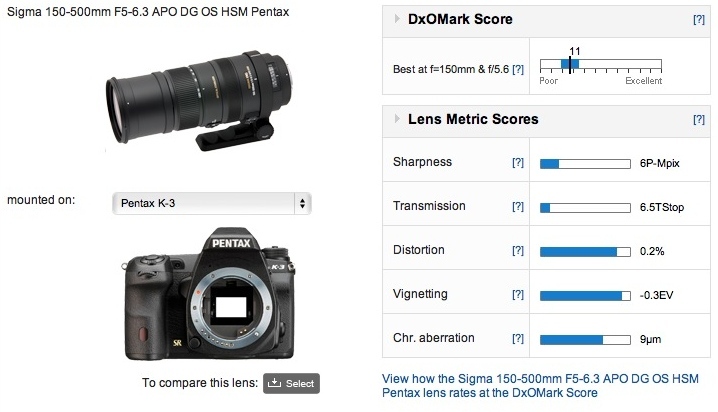 With a DxOMark score of 11 points and a sharpness score of 6P-Mpix the Sigma doesn’t perform particularly well on APS-C format bodies, and is in no way a reflection on the performance of the Pentax K-3. 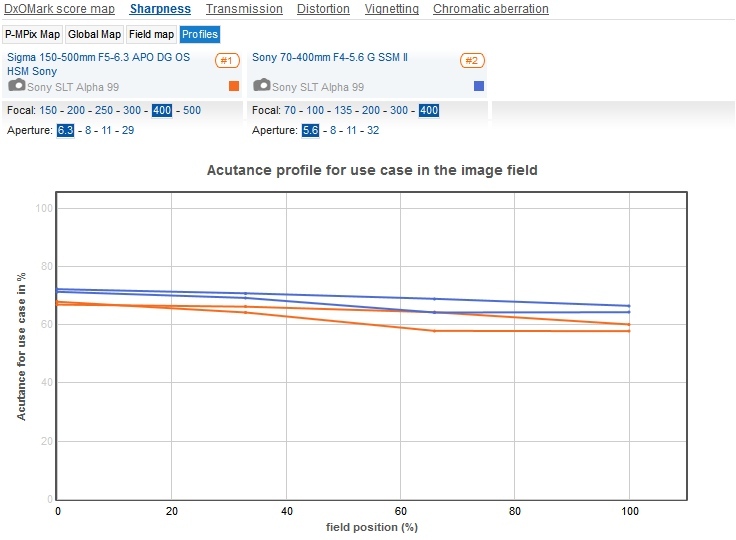 In fact if we look above at the sharpness map of the Sony mount version on the Sony SLT A-77 (above), we can see the performance is essentially identical. Center sharpness wide-open is good up to 300mm but above that sharpness progressively falls away with the longer focal lengths. At 500mm performance at maximum aperture is disappointing and requires stopping down to f11 before acceptable sharpness is realized, and even then only in the center. Vignetting at -0.6EV, as you might expect on a crop camera, isn’t too serious at that focal length (500mm) but there’s some lateral chromatic aberration visible at the edges and corners of the frame. 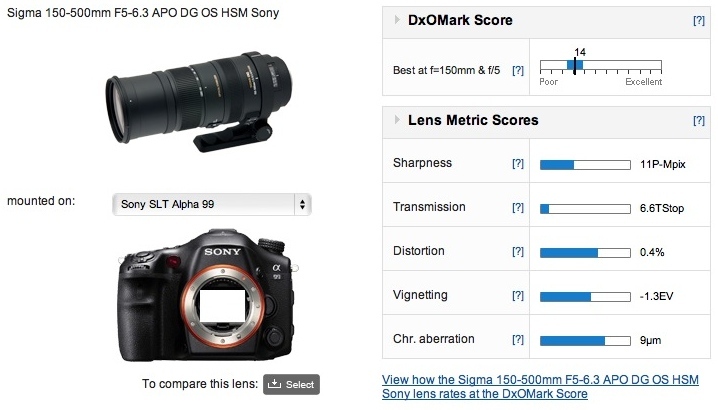 The Sigma is sharper at the shorter end of the zoom range, but it doesn’t perform that well on APS-C format models. Against Sony’s impressive 70-400mm f4-5.6 G SSM II the Sigma is competitive given the extra range. It doesn’t have the same high peak sharpness of the Sony nor does it have the consistent sharpness wide-open, at least at the longer focal lengths (from 250mm upwards). However, the Sigma is quite close in IQ at 400mm and of course has the benefit of longer focal lengths. But the Sony has some other benefits. 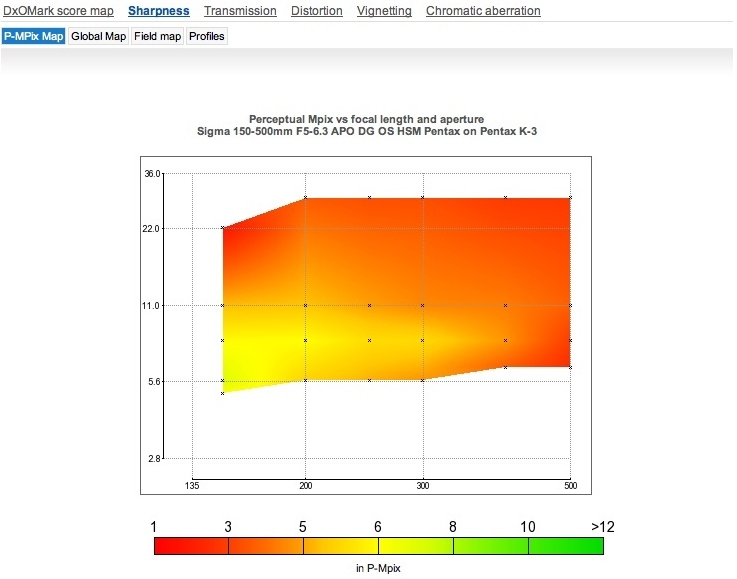 It’s faster at every focal length, varying between ¼ to ½ TStops and has lower vignetting and chromatic aberration at the respective focal lengths. Full aperture performance of the Sigma at 400mm is competitive, although the Sony is slightly sharper and around 1/3 TStop faster. 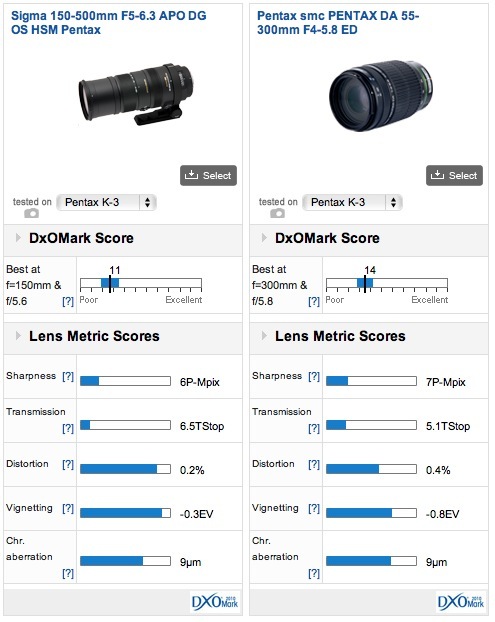 Naturally the less ambitious zoom range of the Pentax favors that model when it comes to image quality and so it’s not much of a revelation to see the DxOMark lens score is higher than that of the Sigma. 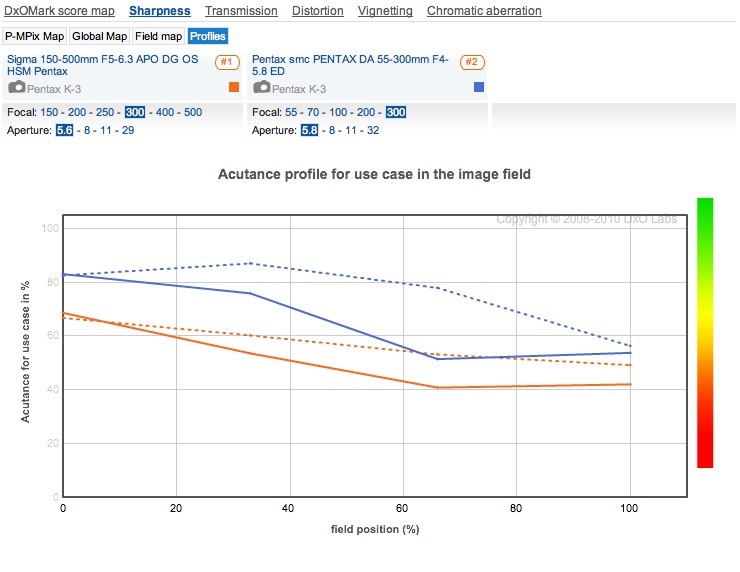 The Pentax actually stands out for it’s high-sharpness at the longer end of the zoom range. It’s notably sharper at 300mm wide-open than the Sigma at the same focal length, with only slight softness at the far reaches of the frame, albeit with higher lateral chromatic aberration. 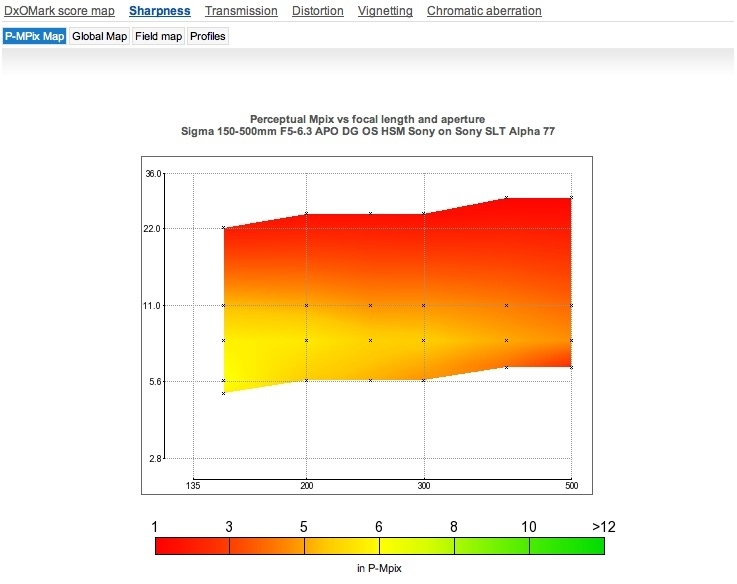 Of course, that’s little comfort to the Sigma user as the 150-500mm is sharper at 400mm than 300mm, although performance drops again at 500mm. Open aperture performance of the Pentax at 300mm is impressive (and well ahead of the Sigma at the same setting), but both suffer loss of sharpness in the outer field. As we established in our previous evaluation of the Sigma 150-500mm Canon and Nikon mount versions, this lens performs markedly better on full-frame models than DSLRs with APS-C size sensors, where the drop in IQ towards the longer focal lengths is more noticeable. That is disappointing given the 500mm focal length option is one of the main attractions. While it’s easy to recommend the Sigma 150-500mm for use with the Sony SLT A-99, it’s not quite so convincing for Pentax users.